I'm super excited to partner up with Uncommon Goods today on Sensible Stylista! For those of you unfamiliar with the brand, they were founded in 1999 in Brooklyn, New York. They're a privately owned company that endeavors to feature unique jewelry, designer decor and handcrafted gifts created in harmony with the environment without harm to animals or people. They run all their operations out of the Brooklyn Army Terminal, and their lowest-paid seasonal worker starts 50% above minimum wage. It's their mission to support independent artists and designers. In fact, half of their collection is made by hand. Most jewelry, decor and table top items are created in the US, and 1/3 of their stuff incorporates recycled and/or upcycled materials. 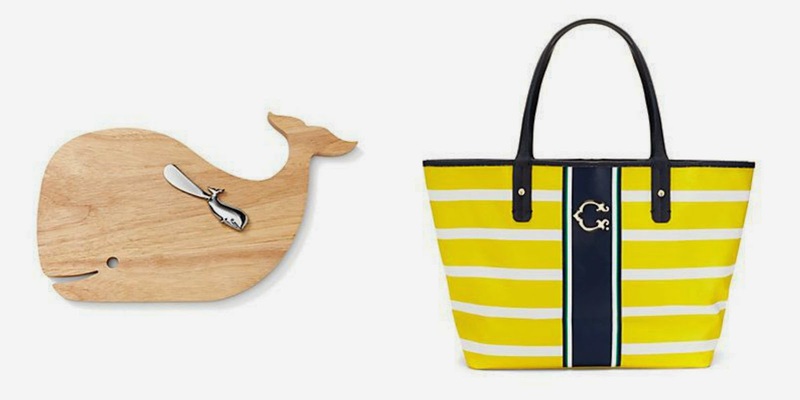 Do yourself a solid and shop here for mother's day. Your mom will absolutely adore the gift you get her, and you can feel extra good about the moolah you spend since you'll be supporting a noble brand who's all about being environmentally & socially conscious. To aid you in your shopping process, I've shared my favorite UG picks with you guys - links are provided below. 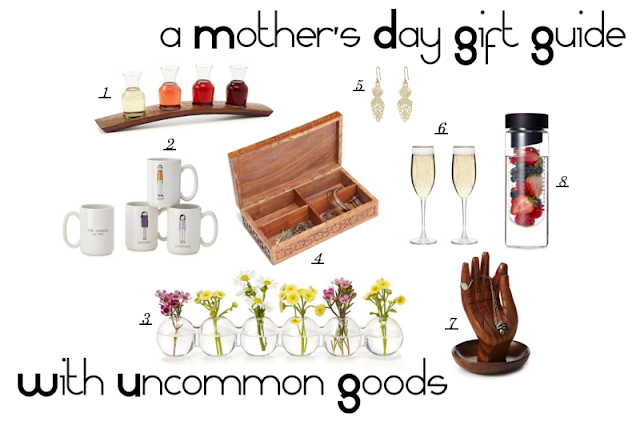 To browse more mother's day gift ideas, click here. If you're looking for jewelry - I'm sorry I only included a pair of earrings above, I would've linked more but I didn't want to bombard y'all - check out this page here. Also, just an FYI, they carry a ton of personalized gifts here so if that's up your alley, make sure you take a looksee. 1. Way Too Tan Dark Hybrid Tanning Silicone: This product's a high-end, one-of-a-kind, multi-purpose tanning lotion that can be used as a sunless product, or outdoors at a pool or beach. It contains ultra-premium silicone emulsion offering a rich, luxe sensation with multiple natural enhancers that give you a fast, gorgeous, and dark tan. Potent anti-aging organic antioxidants, including powerful grape seen extract, help protect and promote a youthful glow and enhance skin health. High concentrations of Sodium Hyaluronate boosts moisture and fights aging by helping skin maintain elasticity and firmness, diminishing wrinkles. It's the BEST sunless tanner I've ever used. 2. MakeUp Forever Ultra HD Foundation: I'm completely and utterly obsessed with this foundation. I can see why it's one of MF's bestsellers - it's very natural-looking! Developed specifically for the film and TV industry's most advanced technology, it creates a naturally flawless complexion. It features uniquely-coated pigments that provide medium to buildable coverage with an even lighter weight, second-skin texture that looks just like skin. For those of you wondering, it's available in 40 different shades. TIP: apply with their skin primer to create the perfect canvas for smoother, more even, and longer-lasting makeup. Apply two pumps in thin layers, starting in the center of the face and stretching outward. Use a flat foundation brush, tap where you need most coverage, and stretch to smooth. 3. 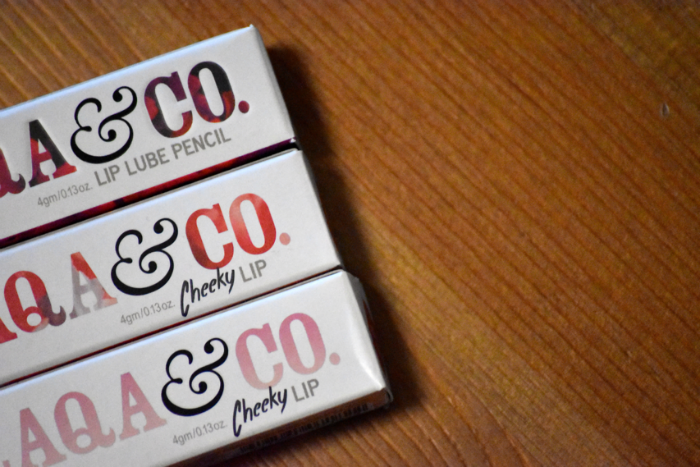 LAQA&Co Lip Pencils: If you're looking for new lippies, make sure you shop LAQA&CO's collection ASAP. Their multi-functional products are creatively packaged featuring artwork by young artists who each receive a cut of the profit from every product purchased. Their lip pencils are light weight yet matte. 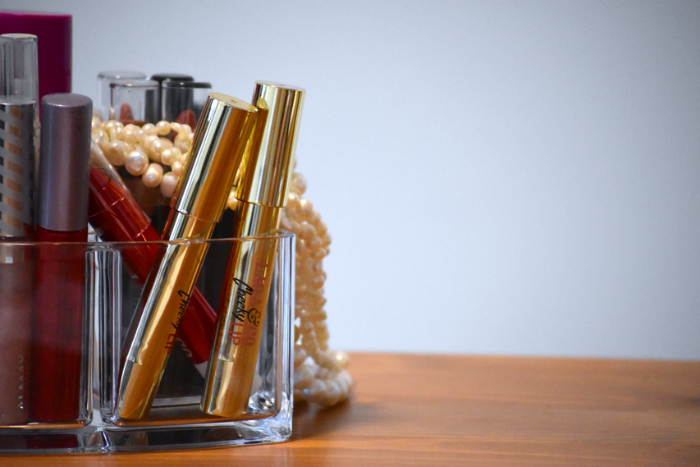 They double as lip and cheek stain and give you a fab fresh-faced glow that lasts all day long. I also got to try their Lip Lube in Golly Geez Whiz. It's a high-gloss, lightly pigmented lip balm that also works as a lip plumper. If you want a bolder color, simply layer. 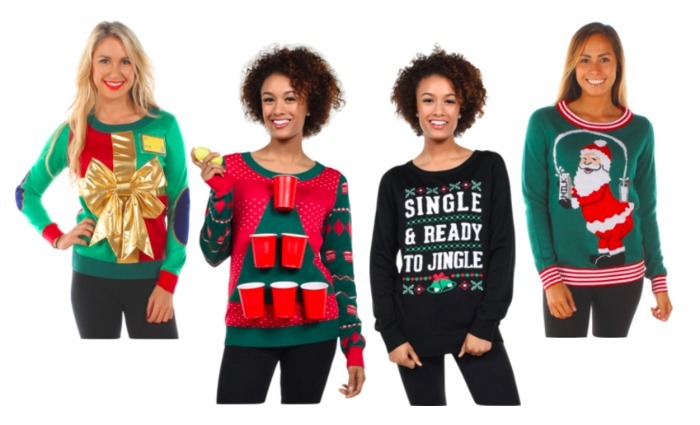 FYI, use code HOLIDAYLOVE to get an extra 30% off your purchase - valid until October. 4. Jessica Simpson's Ten - I was thrilled to see Jessica Simpson's new fragrance included. This perfume has a lovely floral, fruity scent that's combined with a feminine and sophisticated undertone of vanilla infusion, white chocolate bean, sandalwood, and driftwood. 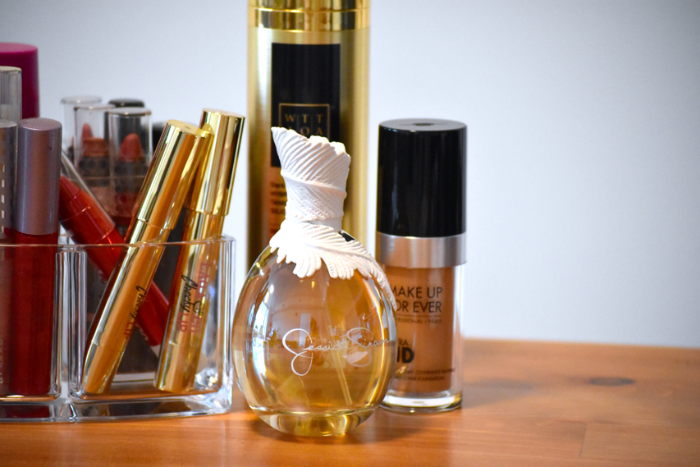 The bottle's design mirrors the tenth anniversary theme with a single, elegant feather at the top, a symbol of the brand's free spirited style. 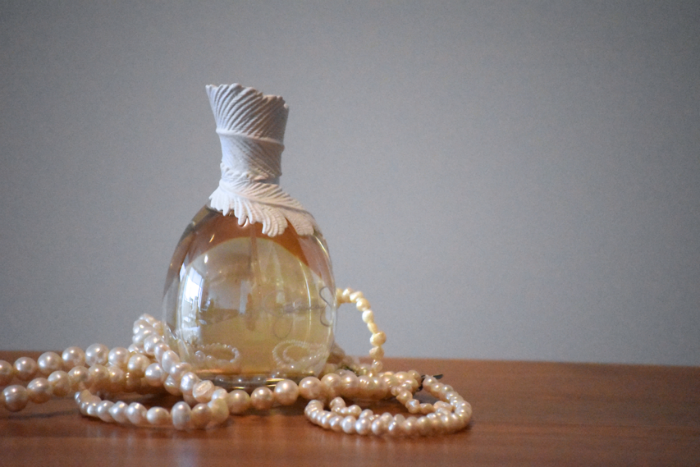 This scent was created in collab with senior perfumer Mary Pierre Julien of Givaudan. FYI: if you purchase a full sized fragrance from JS, you get a complimentary signature tote bag with your purchase. Clicky here for deets! This post was sponsored by BabbleBox.com on behalf of Single Edition Media. How it works: Three pieces of hand curated jewelry delivered to your door worth at least $100. It's like having a trusted friend select a few key items to update your wardrobe every month, at a fraction of the retail price, without having to make a trip to the mall. You'll receive your box by the 15th of every month - comes with a tracking number so you can keep tabs on your box. Available plan/s: $35 a month for jewelry to keep - 3, 6, and 12 month subscriptions available. They automatically renew after each term so make sure you cancel if you want out. Cancellation policy: You can cancel from your account page or just send them an email. They ask you to cancel your subscription up to the last day of the previous month. Benefits: They include their fave styling tip with Your Bijoux Box, and they share a ton of inspo on their blog and social media platforms. How it works: Take a style survey, add items to your jewelry wishlist, and get 3 pieces to wear on loan. 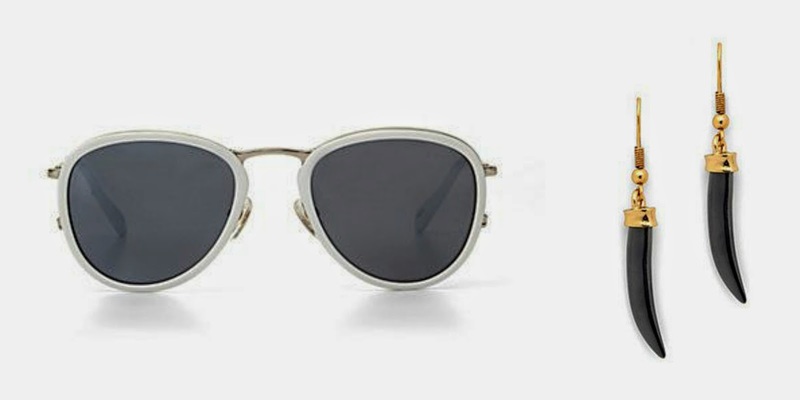 Pieces are hand-selected based on your style - FYI you can make specific requests - and wear them as long as you'd like. Return them anytime, as often as you'd like. Contains designer jewelry worth an average of $200 per set. Available plan/s: $19 for unlimited jewelry rental. Cancellation policy: You can cancel or put your Shine Insider Status on hold at any time. They'll continue to bill until tracking activity is present on the return of your last Rocksbox set. Benefits: $10 monthly credit you can use to buy any piece from your Rocksbox set. Free shipping both ways + fits in your mailbox. Designers: Gorjana, House of Harlow 1960, Vanessa Mooney, Kendra Scott, and more. 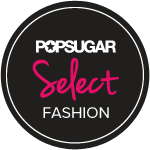 Featured on: Refinery29, Glamour, NewYork, Forbes, and more. How it works: Mynt Box stylists select jewelry and accessories (3-5 pieces) every month for you to keep. 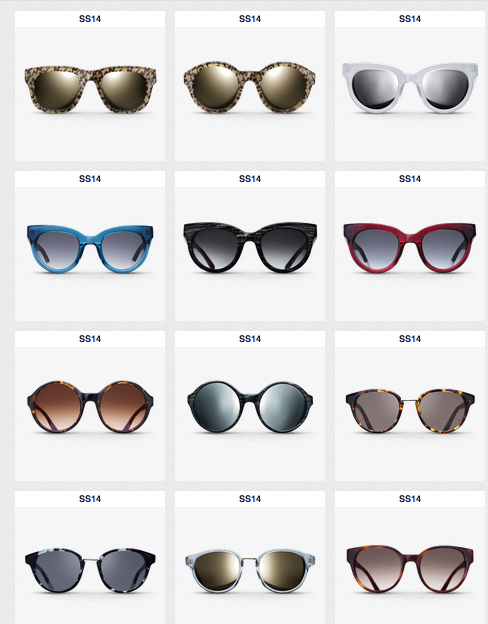 The selection depends on what box you select (luxe, mixe, or boho) when you visit their "Subscription Boxes" page. Boxes are sent on or around the 15th of every month - takes about 2-3 weeks to arrive. Available plan/s: $40 per month + S/H ($5) - 1 ($40), 3 ($100), 6 ($200), 12 ($400) month plans available. Cancellation policy: Log into Paypal to stop recurring charges - must cancel before you're billed for the month. You can also skip a month or two by logging into PP and clicking "suspend". How it works: Choose one of three Jewelbits styles: Boho Babe, Glam Gal, or Classic Chick. You can change your box at any time. Choose a plan you like, and then enjoy the jewelry you get! 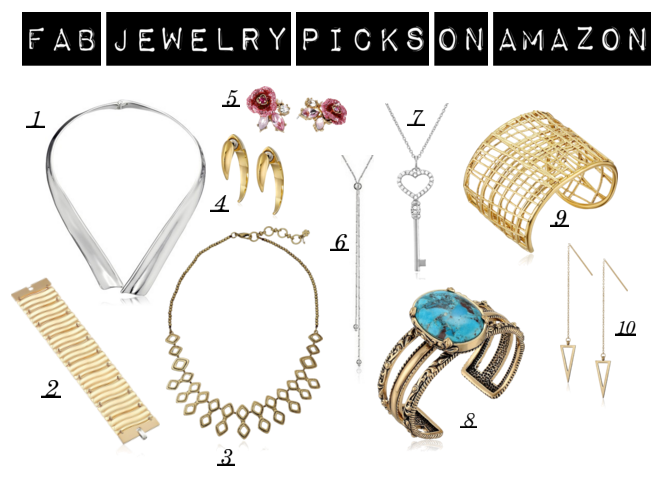 Each box comes with 2-3 hand-selected boutique jewelry pieces based on your style. The average retail value of each box is about $125. Available plan/s: Month-to-month for $39/month, 3 months for $37/month, and 6 months for $33/month. No shipping or handling fees for US residents. Sales tax may apply for those in NY, NJ, MA, and VA. They also ship to Canada, but you'll have to pay an additional $10 fee. Cancellation policy: Go to your account and click "Cancel My Subscription." They'll stop sending your Jewelbits box pronto, just make sure you're not within 7 days of your next delivery. How it works: Think Rent-the-Runway meets Birchbox meets BaublebBar. Simply take the CliCo Style Survey so stylists can best personalize the jewelry you receive. You'll get three pieces to wear all month long. If you fall in love with your baubles, you can keep them for affordable prices or send them back at the end of the month and enjoy the next set. Available plan/s: $14.99/month for jewelry rental. Cancellation policy: You can cancel at any time. Launching: this July! Sign up HERE, and join by July 5th to get your first set this month! Also, follow them on instagram to check out their collection. Additional discount: Use code SENSIBLESTYLISTA to get a free month! 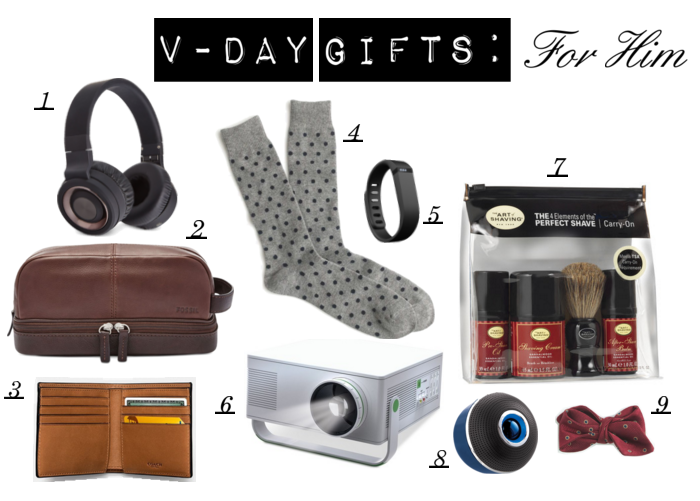 Father's day is fast approaching and, if you're like me, you have no idea what to get your dad. Luckily, there are a ton of online resources to help you decide. In the list below, I've created individualized sets for 5 different types dads and gave y'all a splurge, spend, and save gift option for each! 1. HSN Portable Charger - If your dad stays up-to-date with the newest technology then these are the items for him. If you have a techie dad he's probably always on his phone, using up its battery all day. It's annoying to have to take a charger with you wherever you go, plus it can be difficult to find an outlet at times. Help your dad preserve his phone battery with this neat little gadget. He can charge it alongside his phone each night and plug his phone in it whenever his battery starts to get low the next day. 2. 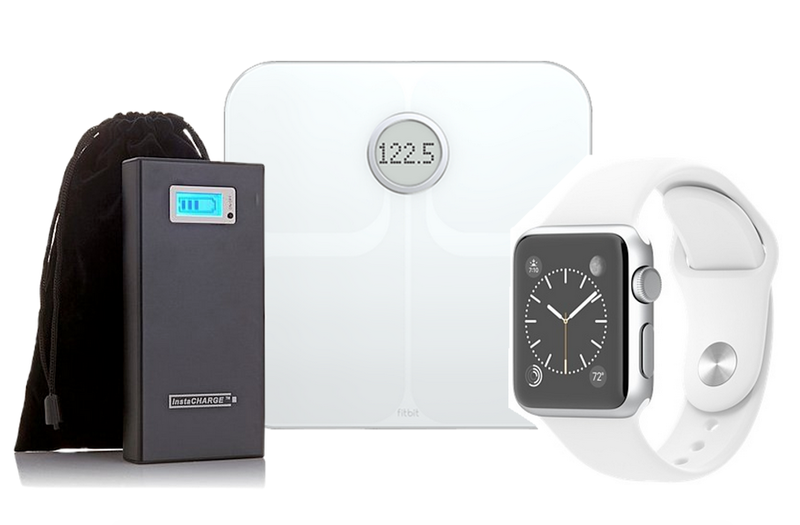 FitBit Scale - With the sleek FitBit scale, your dad will quickly get his weight, BMI, lean mass, AND body fat percentage. It's like a whole doctor's visit in one easy step! The scale uses wifi to sync wirelessly with one's devices and comes in two colors -- black and white. It recognizes up to 8 users, so you can get use out of it, too! 3. Apple Watch - You guys probably already know all about the Apple watch, but its main function (besides telling time) is to send your phone's notifications directly to your wrist. This is perfect for the Dad that's constantly getting new texts and emails - he won't have to get his phone out of his pocket to check it constantly anymore. 4. Helios Sun Hat - If your dad loves hiking, biking, or anything that involves the summer sun then he definitely needs a protective hat. This hat comes in four colors and has a 50+ UPF rating, meaning it can block a lot of sun! It also has a moisture resistant head band which helps keep sweat away from one's brow. 5. Swiss Army Pocket Knife - A swiss army knife is a staple for any outdoorsy dad. This knife has anything and everything your father could ever need including four different kinds of bit wrenches! 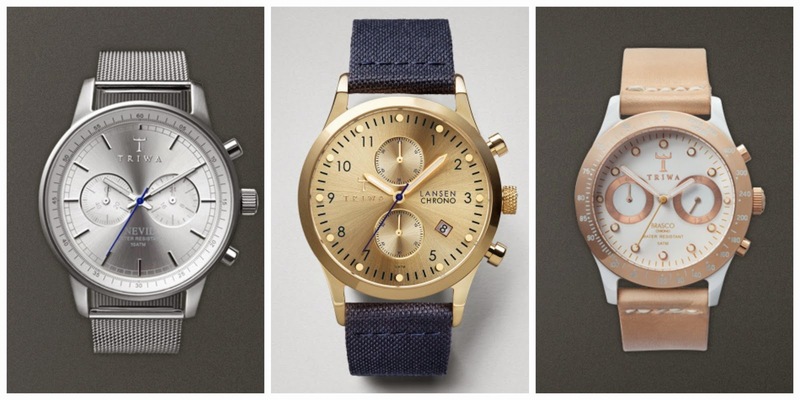 It comes in both navy blue and red so you can pick the perfect style for your father. 6. Walmart Cabin Tent - Finally, if your family likes to go camping then your dad needs a high-tech tent. This "Cabin Tent" is aptly named as it is honestly as big as a cabin. It can fit up to 12 people and has enough room for three queen-sized air mattresses! 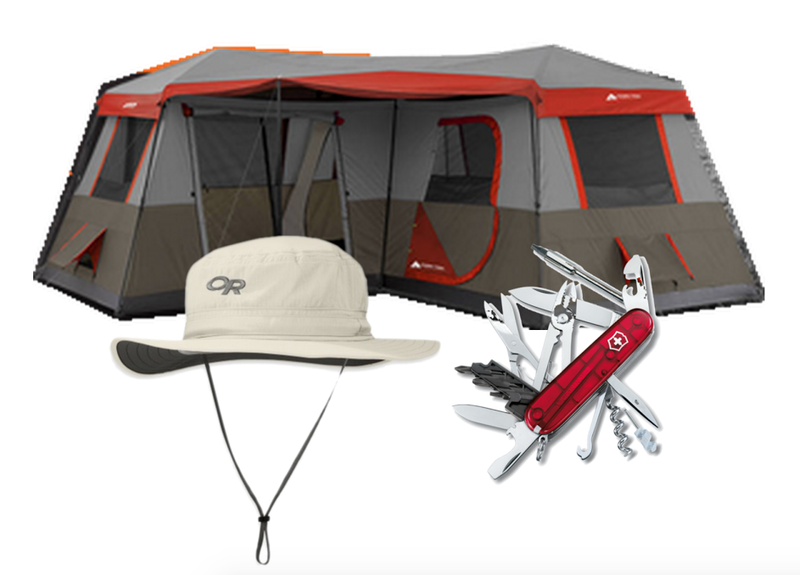 There are three different rooms inside this tent, and it comes in brown and red. 7. Uncommon Goods Omelet Maker - If your dad loves food, he probably spends a lot of time in the kitchen; cooking is no quick task! This can make the early morning rush hard. He obviously wants to eat good food, but that's hard when one only has 15 minutes to get to work! This omelet maker aims to help with that; it claims to cool omelets in only 45 seconds! All you have to do is put your ingredients into the clay bowl, stick it in the microwave for 45 seconds, and you have yourself an omelette! This bowl is handmade in Texas and comes in one design. 8. Amazon Portable Grill - The "Foodie Dad" probably spends a lot of time outside at the grill. Let's be real, there's nothing better than a summer barbecue in your backyard with your dad at the grill. However, what if you could have those summer BBQs at places other than your backyard? With this portable "suitcase" grill you can bring the party anywhere, to a beach, a park, a camping trip, wherever you want! The grill can cook for two people at a time and is made from stainless steel. 9. William Sonoma Knife Set - Knives are a necessity in every kitchen, and there's nothing more desirable to a chef than a set of good knives. 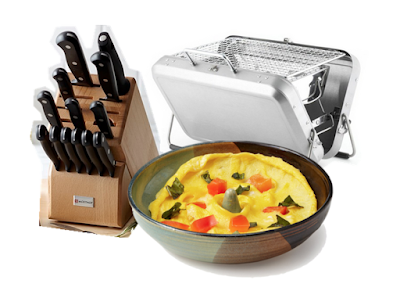 This particular set comes with 18 knives (made in Germany from high-carbon stainless steel) + a wood block for storage. A set of scissors are included as well! 10. Maker's Mark Bourbon Ice Tray - If your dad loves enjoying liquor in a classic scotch glass then you know he can't use regular ice to chill his drink. 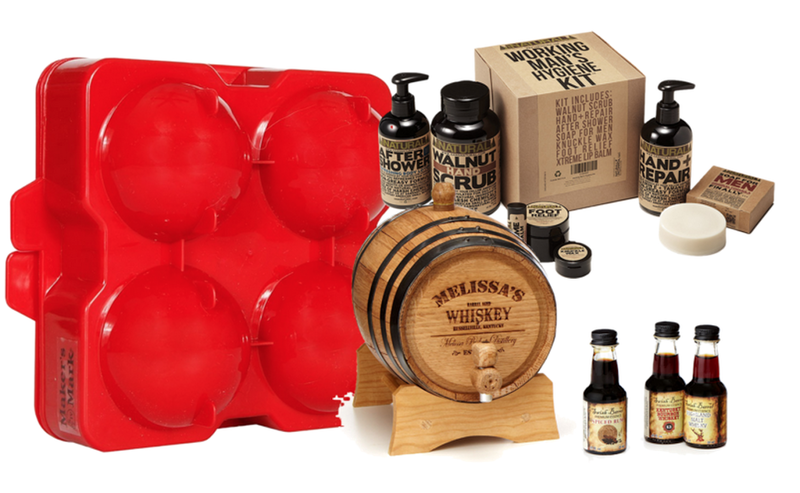 With the Maker's Mark ice tray, your father can make his own perfect bourbon ice balls. This tray makes four ice balls with the Maker's Mark logo imprinted onto them. 11. Uncommon Goods Hygiene Kit - If keeping his moustache slick and hair gelled back is important to your father, he definitely needs the "Working Man's Hygiene Kit." This kit comes with walnut scrub, soap, knuckle wax, after shower oil, hand repair, foot relief, and lip balm. Basically, it contains everything your dad could ever need to stay clean and smooth. 12. Uncommon Goods Personalized Whisky Barrel - To go along with his new bourbon ice balls, your father needs a classy way to serve his drinks. You can get this cool Whiskey Barrel personalized with the owner's Name, distillery name, year established, city, and state. It comes in two sizes -- 2 liters and 5 liters-- and you can add on a whisky making kit if you really want to spoil your dad. 13. Thompson Sweat-Proof Tee - If exercise is important to your dad, he's probably used to sweating through his shirts. With this Hydro-Shield tee that doesn't have to happen anymore. It's made from cotton and polyester and has a "patented sweat-proof barrier" that allows body heat and sweat to "escape as vapor." Basically, your dad can go for long runs without coming home a smelly, drenched mess! 14. FitBit Flex Watch - Watches like the FitBit and Jawbone have been all over lately; people everywhere are wearing these gadgets. The FitBit Flex Watch is aimed towards activity and sleep, but it also records heart rate and fitness. This watch tracks your steps, distance, calories burned, active minutes, sleep, and has alarms to wake you up. It comes in ten different colors and has a large and small wristband to choose from. 15. 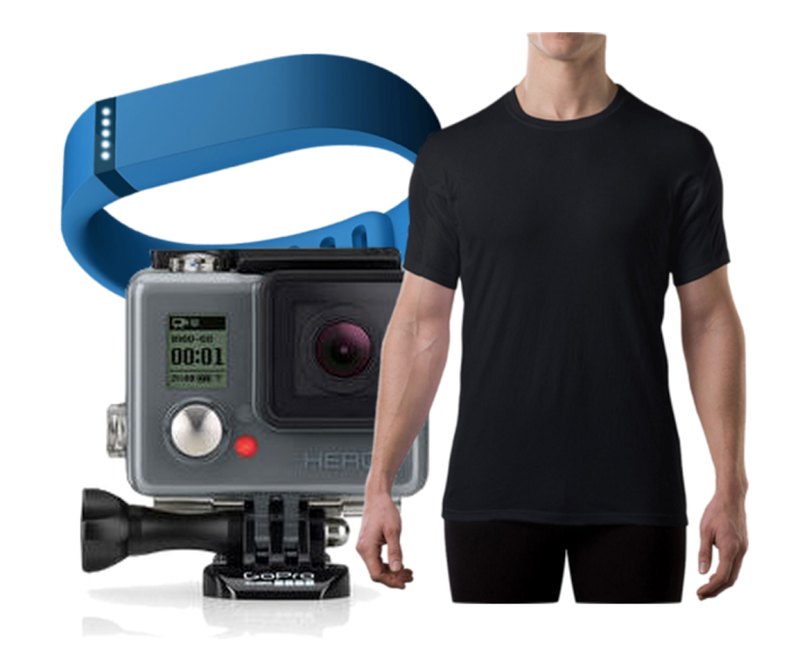 GoPro Hero Camera - The last item on our list is a GoPro. If your father is full of adventure and constantly does new, fun things then he needs to get it on video for you and your family to watch! The GoPro is a small video camera that you strap onto yourself to record physical activities sans hands. It comes with a waterproof case so you can take it in the water! What do you guys think of this list? 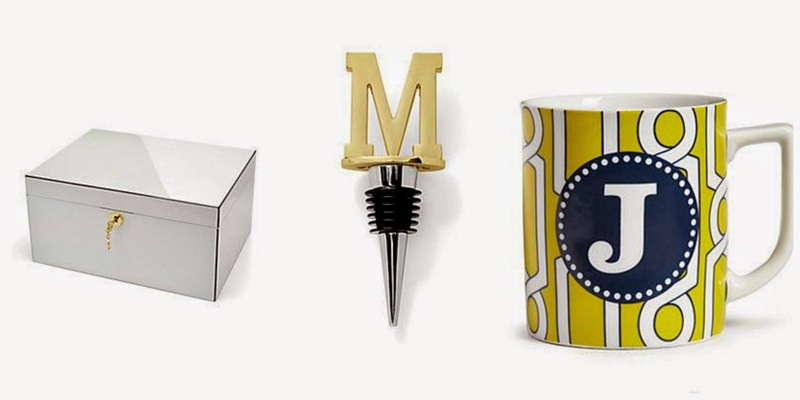 Are you going to be giving your dad any of these gifts? Let us know in the comments below if you like or dislike anything we listed!